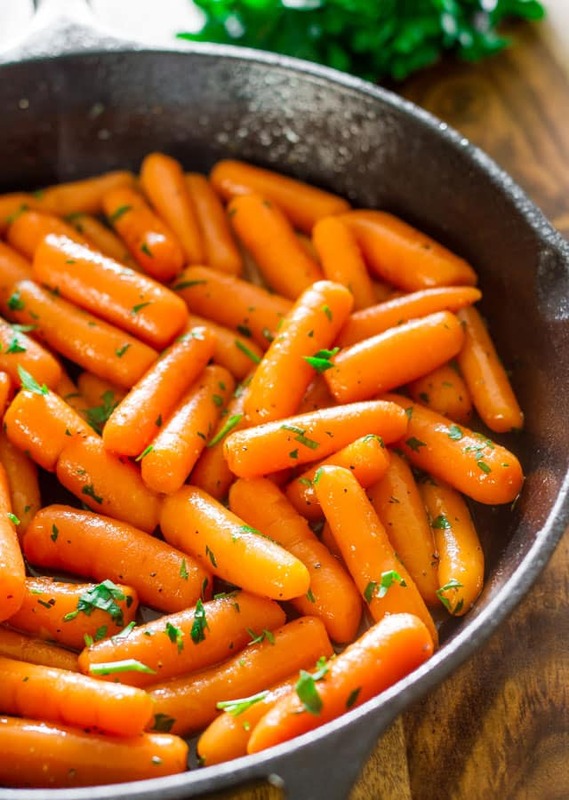 Brandy glazed carrots – scrumptious baby carrots in a delicious light brandy sauce, perfect side dish to your holiday dinner. Incredibly easy to make and ready in only 20 minutes! With so many things happening during the holidays, it’s great to have easy recipes such as these brandy and honey glazed carrots that are fuss-free and a perfect side dish. They’re cooked all in one skillet and you end up with tender, sweet glazed carrots every single time. What I love most about these carrots is how elegant they look, colorful, shiny and scrumptious. Although these are the perfect side dish for your holiday dinner, I would literally make these any time of the year for any occasion. 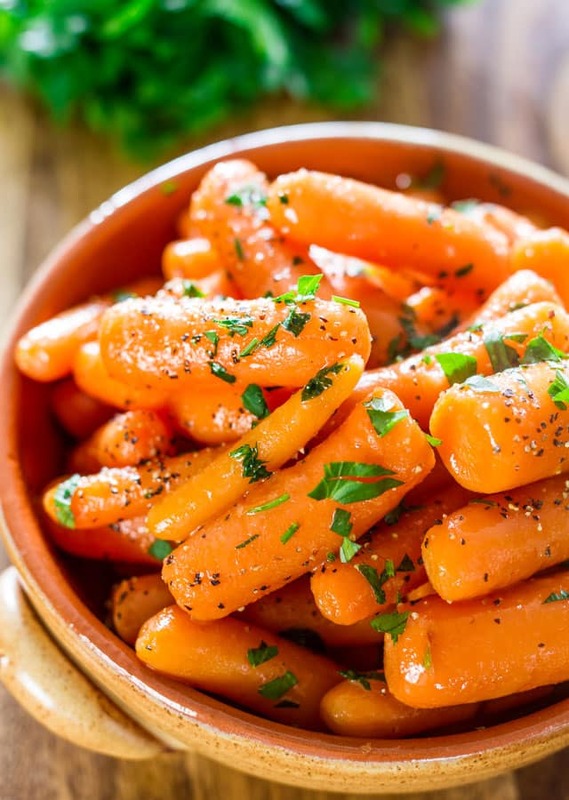 Carrots – I love using baby carrots, but you can totally use regular carrots sliced on the bias about 1/4 inch in thickness. Butter – butter does make everything better and I really wouldn’t skip it. Honey – use your favorite honey. Brandy – this is the star ingredients, but for an alcohol free version add some garlic instead and make honey garlic carrots. Salt and pepper – use as much or as little as you like. 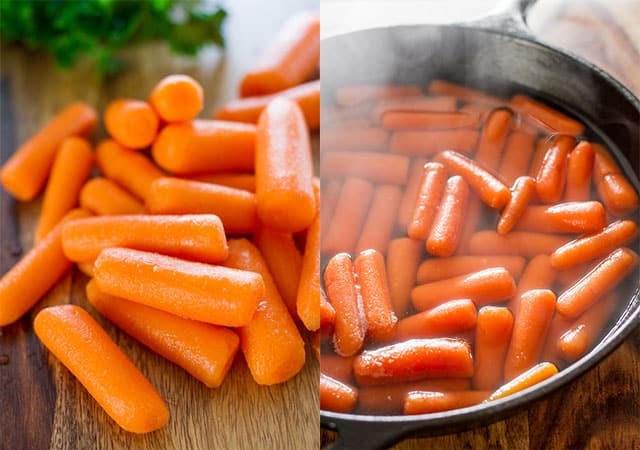 Cook carrots: In a large skillet, bring 1/2 inch of water to a boil. Add carrots, cover and cook until carrots are crisp-tender. Drain and set aside. Make the glaze: In the same skillet, cook butter and honey over medium heat until butter is melted. Stir in the brandy and bring to a boil. Cook until the liquid is reduced to about 1/2 cup. Add carrots and finish dish: Add the carrots, parsley and season with salt and pepper. Heath through and serve. Store any leftover glazed carrots in an airtight container and refrigerate for 3 to 5 days. 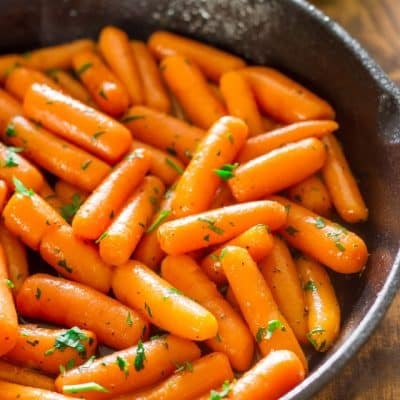 Brandy glazed carrots - scrumptious baby carrots in a delicious light brandy sauce, perfect side dish to your holiday dinner. Incredibly easy to make and ready in only 20 minutes! I don’t usually find myself gushing over a recipe. This one is amazing. My husband, who is not a carrot lover, went nuts over these. The flavors of the butter, brandy and honey are so warm and comforting. We are going to be having a lot more carrots in our future. My husband was even wondering if we could try sweet potatoes with this glaze. Thank you so much for sharing this recipe. It is the only way we will make carrots from now on. Thanks for your comments Debra and so glad you liked the Brandy Glazed carrots. I like your idea about the sweet potatoes and if you give it a try, let us know. Greetings! Thanks for stopping by! You had me at Brandy! Did somebody say brandy? This is perfect, Jo. Simple, beautiful and obviously delicious. Definitely something I want to make. And, I still don’t have a cast iron skillet, but it’s on my wish list! Oh Andrea I hope you get one, you’ll love it!!! These glazed carrots look incredibly delicious. Loving the addition of brandy – definitely a recipe I need to try! These look fantastic! I grew up with a similar recipe which Mum would serve at Easter and Christmas – she just skipped the brandy. I’ll have to try it with the brandy this Thanksgiving.